o An oil drilling rig is a structure that houses equipment such as the derrick, pipe, drill bits and cables necessary to extract petroleum from beneath the earth's surface. Oil drilling rigs can be either offshore for drilling into the ocean floor or land-based. o According to Rigzone, the most often used offshore, movable drilling structures, called jackups, have bottom supports. The hull or main deck area is supported by columnar or open-truss legs. These units drill up to 350 feet deep. o Other offshore oil rigs, floaters, or semi-submersible drilling units float offshore on hollow columns or giant pontoons which when filled with water can submerge the rig to the required depth. This type of rig is normally used for drilling Wildcat Wells (new wells) and can withstand rough seas. o More permanent offshore immobile steel or cement structures, called fixed platforms, house drilling rigs that open new development wells. These large units also house crew and equipment and are connected to the ocean floor. Most of these are found on continental shelves up to depths of 1,700 feet, and because of their directional drilling capacities can be attached to numerous wells up to a five-mile radius. 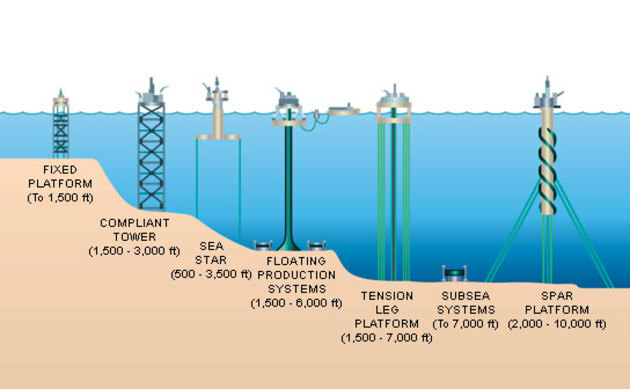 o Another type of offshore drilling rig, the complaint tower, consists of a flexible, narrow tower supported by a piled foundation. Its conventional deck operates both drilling and production, and this sturdy unit sustains lateral forces and deflections in water from 1,500 to 3,000 feet depths. o Drillships, usually built on tanker hulls, have been fitted with drilling devices and are used in deep water for experimental drilling. Dynamic positioning systems keep the ship over the well. o Oil rigs operate 24 hours a day, seven days a week, usually with three or four crews that operate the rig in shifts. Some oil rigs run on eight-hour shifts, others on 12-hour shifts. There are many different jobs be done on an oil rig, including technical drilling, management, mechanical maintenance, security as well as cleaning and catering for the crew. o The drill crew usually is made up of five positions. "Roughnecks" work on the floor of the rig and in the mud room, operating machinery and maintaining equipment as necessary. Derrickmen are responsible for running mud-room equipment, including mud pumps and holding pits. Derrickmen are assisted by a pumpman, and both positions undertake roughneck duties as required. The assistant driller supervises the roughneck, pumpman and derrickman, and assists the driller, who is in charge of the drilling operation and who runs the equipment. The driller has a high level of responsibility and expertise. University education is not required, but technical training and experience is for drillers and drillers assistants. As of May 2010, roughnecks could expect to earn about $59,000 annually; pumpmen $60,500; derrickmen $65,000; assistant drillers $72,500 and drillers $86,000. o The deck crews consist of five positions. Maintenance roustabouts perform general maintenance duties such as cleaning and painting the rig deck; as of May 2010 they could expect to earn about $47,000 annually in this entry-level job. The maintenance foreman is responsible for overseeing the work of the maintenance roustabouts and earns about $59,000. General roustabouts, distinct from maintenance roustabouts, help guide the deck crane and also help roughnecks on the rig floor when needed; they earn about $54,000. Assistant crane operators are typically experienced roustabouts who have the qualifications to operate cranes, earning $59,000. The crane operator has the main task on deck of operating the crane and of supervising the deck crew. The crane operator earns about $69,500. o Since a large number of the world's gas and oil reserves are offshore in unstable regions such as the Middle East, Africa and South America, security is a concern aboard oil rigs. Most security guards aboard oil rigs are employees of specialized firms and many are ex-servicemen with significant expertise in security issues. Technology plays a large part in oil rig security, including the use of radar sensors to detect incoming vessels. While the mean annual wage for a conventional security guard in 2009 was $26,430, according to the Bureau of Labor Statistics, security personnel in the energy sector had a mean annual wage of $64,610. o Oil rigs are large industrial structures with a wide variety of different jobs, ranging from those that drill for oil and handle the equipment to those who support the operations of the oil rig and take care of the other workers. These jobs suit a wide variety of vocational skill sets, though they all require living on or near an oil rig for extended periods of time. o Roustabouts work with heavy machinery on the deck of the oil rig, moving crane loads and supplying equipment to the rig's floor. They are also responsible for keeping the main deck areas clean and tidy. When times are very busy, roustabouts also assist roughnecks. Roustabouts make over $50,000 per year on most rigs. o Roughnecks work on the drilling floor in teams of three and are the main people responsible for operating the equipment, repairing it and making sure it is working efficiently. They are directed to do different things on the floor by the driller and are also responsible for checking the mud levels on the drill itself by checking with the Mudman on a regular basis. Roughnecks make about $60,000 per year, on average. o Drillers are the highest position on the drilling floor and are the generals of how the equipment operations are done. They are also in charge of everything that is happening on and above the rig floor. The driller is the person who actually operates the drilling rig equipment and makes a hole in the sea bed to try and find the oil. Drillers make over $80,000 per year on average. o The Company Man or Woman is the oil company's representative who lives and works on board the oil rig. They are not employed by the drilling company who is operating the rig, but by the oil company funding the operation. Their responsibility is to monitor what is occurring on board and report back to the oil company to make sure everything is running smoothly. A Company Man or Woman makes upwards of $150,000 per year. o CRO's are control room operators who monitor the controls, electricity and general operations are working on board. They monitor weather in the area and make sure the rig's basic systems, like electricity and plumbing, are operating correctly. They have a number of assistants who are all seasoned seamen and know how to work and live on the open ocean. CRO's make around $65,000 per year; their assistants make just under $60,000 per year. An oil company is in business to extract oil and sell it on the world market. Most of the time, this means drilling. The largest oil companies, commonly referred to as "Big Oil," usually do not own the drilling rigs used to find and extract oil. They lease the rigs from companies that do nothing but move from location to location and drill wells for the companies that hire them. Most of the jobs available in the oil field are with the drilling companies. o Operational jobs on a rig are directly related to drilling the well. Once a new hire is trained in rig operations and safety, he can become a roughneck. The roughneck works to connect new sections of drill pipe to the section already in the hole. This process is repeated as the drill bit, or tool, is pushed further into the well. The roughneck also performs preventative maintenance on rig equipment and mixes the chemicals for the drilling fluid that lubricates the bit as it is pushed through the well. Roughnecks can be promoted to other positions on the drill crew, such as motorman or derrickman. The motorman, as the name implies, is responsible for the motor that drives the drill. On an oil rig, time is money, so any delay or malfunction can quickly cost the company tens of thousands of dollars or more. Therefore, the motorman's job in keeping the motor in top shape is crucial to the rig's operations. The derrickman is responsible for everything in the truss work, or derrick, seen on most drilling rigs. The derrickman climbs to the top of the derrick and helps guide new sections of pipe into position so the roughnecks on the rig floor can connect them. Fear of heights is not an attribute for a derrickman to have. The derrickman is also responsible for preventative maintenance on all the equipment in the derrick. o The assistant driller is the first-level supervisory job. He supervises all the roughnecks and works directly with the driller to ensure smooth operation of the well. The upper supervisory positions are the driller and the rig supervisor. The driller operates the drill motor and acts as the primary on-scene decision-maker on the rig floor. He directs the actions of the assistant driller, motorman, derrickman and roughnecks to ensure smooth rig operations. He also determines the speed and pressure of the drill bit, which determines how fast the tool gets pushed into the hole. The rig supervisor, once known as the "toolpusher," is the top of the heap in rig operations. He is responsible for all rig service, maintenance and operations. If ExxonMobil leases a rig from TransOcean, ExxonMobil would naturally want to have its own man on the rig. This individual is called the company man. He works directly with the rig supervisor to ensure the well meets the company's expectations. The company man is therefore the final authority on rig site except on some off-shore rigs where an installation manager, who acts as captain of the ship, can overrule the company man on issues of safety. o Operational jobs are very similar, whether the rig is land-based or offshore. Rig service jobs have similarities between land-based and offshore rigs, but there are some noticeable differences. The first major difference is that "rig service" is called "deck crew" on an offshore rig. A roustabout is an unskilled laborer who is responsible for just about everything not related to drill operations. Jobs such as painting stairs and unloading trucks fall under the responsibility of a roustabout. On offshore rigs, the roustabout's main duty is to guide the crane operators as they move heavy equipment, pipe and cargo containers. An operator supervises a team of roustabouts. He is also trained in the operation of hoisting equipment such as cranes and wenches. On an offshore rig, the crane operators are vital to the rig. They operate heavy-lift cranes to transfer cargo, and sometimes personnel, back and forth between the rig and its supply ships. o Drilling rigs have several specialists. Some work on a full-time basis, while others are only present when their services are needed. The mud engineer ensures the drilling fluid meets the specifications called for by the rig supervisor and the company man. The chemical makeup and density of the drilling fluid is varied depending on well conditions. Various forms of cement are used at different times in the well. Like the mud engineer, the cementer is responsible for ensuring the cement meets the specifications called for by the rig supervisor and the company man. A geologist is on hand to examine all the available data from the well to help drillers know what to expect. They also examine data to determine the progress of the potential for reaching oil. Many offshore rigs also have a division called subsea, which operates a small unmanned submarine to inspect all the underwater portions of the rig, especially where the drill pipe enters the seafloor. o A crew has to eat. Catering services are sometimes a part of the service crew for an oil rig, but sometimes catering services are contracted out. Depending on the size of the rig site, roustabouts might be responsible for keeping things clean. On offshore rigs, housecleaning services are required for the living quarters as a deck crew or drill crew can be living on the rig for a month or more at a time. o Safety is the responsibility of everyone from the roustabout to the rig supervisor, but each rig has a dedicated safety officer. The safety officer runs the rig's safety programs, conducts safety meetings and safety reviews, and routinely inspects the rig for safety issues. Essar Oil – operates a fully integrated oil company of international size and scale in India. Sinvest ASA – long-term financial and strategic investor in oil- and offshore companies. Kuwait National Petroleum Company Kuwait. AED OIL Limited – acquiring, developing and commercialising specified oil fields and undertaking oil exploration Melbourne, Australia, Australia.